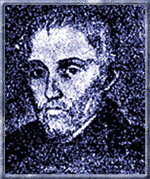 After receiving his early musical education in Segovia, Spain, Victoria travelled to Rome under a grant from Philip II to study at the Collegium Germanicum, the Jesuit run seminary intended to train candidates from the German territories for the priesthood. Upon completing his studies, he held rather humble positions at several Roman churches before being appointed chapelmaster at the Collegium Germanicum. In 1586 he returned to Spain and entered the service of Empress Maria, the widow of Maximilian II, remaining with her until his death. Although never a member of either the Cappella Sistina or the Cappella Giulia, his music soon found its way into the repertories of those respective institutions. Victoria's music resembles Palestrina's in its technical perfection but allows for a greater degree of harmonic color, rhythmic vigor and vocal expressiveness.